The good folks at the Idaho BLM celebrate the installation of a new billboard warning folks to checks fire regs and not to park on dry grass. 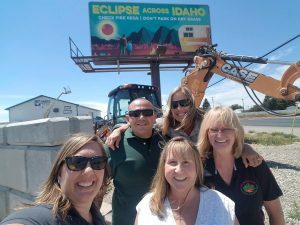 On Monday, August 21, 2017 those of us fortunate enough to be in in Idaho at the right place at the right time can experience a total eclipse of the sun. This is the first total eclipse on American soil since 1991, the first on the mainland since 1979 and the first to sweep the entire country since 1918. An eclipse is the alignment of celestial bodies when one is obscured, either partially or totally, by the other. An umbra is a complete shadow caused by a celestial body (such as the moon or the Earth) where the source of light (such as the sun) is totally hidden from view. A lunar eclipse happens when the moon passes through the Earth’s umbra. A partial or full lunar eclipse only occurs at night during a full moon. A solar eclipse happens when a new moon passes directly between the sun and Earth, casting the moon’s umbra on Earth. The sun appears to be either partially or totally blocked by the moon. This August, anyone in North America will be able to see a partial solar eclipse, but to see a total solar eclipse you must be in the path of totality. This is a relatively thin ribbon around 70 miles wide that will cross the U.S. from west to east. That morning, the first point of contact will be at Lincoln Beach, OR at 9:05 a.m. PDT, with totality beginning at 10:16 a.m. Over the next hour and a half, the solar eclipse will move through Oregon, across Idaho and eastward until it ends near Charleston, SC at 2:48 p.m. EDT. The longest duration will be near Carbondale, IL, where the sun will be completely covered for two minutes and 40 seconds. People from all over the world will travel to the U.S. to see this rare event, some of whom have been planning their trip for years. There are 24 communities in Idaho that will experience totality in a swath from Weiser in the west to Victor and Driggs in the east. Borah Peak, the highest point in Idaho, will be in the path of totality and probably be one of the more popular viewing sites in the state. Most lodging and campgrounds are booked and dispersed camping may not be allowed, so making your plans ahead of time to ensure a safe and fun experience. There will be a high volume of visitors congregating in path of totality, so don’t plan on traveling the morning of the eclipse to get to a place to view it. Arriving at your site early and staying for an extra day or two will help you avoid traffic issues. Be prepared for highly congested roads and camping areas. Don’t block roads – keeping roadways open for emergency traffic and other visitors will improve everyone’s experience. Make sure you have the proper supplies and gear. Cell service may not be available, so plan your route in advance and pack a map. Familiarize yourself with the rules and specific information about the site you are visiting. Many roads on public lands are gravel and may require a high-clearance or four-wheel drive vehicle. Make your vehicle is in good repair, bring extra water and make sure your spare tire can get you to a service station, which could be a good distance away. Most remote areas have limited services and facilities, so pack plenty of food and water. Be prepared for hot temperatures by wearing the appropriate clothing and using sun protection. One small spark is all it takes to start a wildfire that can devastate natural resources, destroy wildlife habitat and put property and life at risk. Unfortunately, most wildfires are human-caused. The good news is, practicing fire safety means that most of these fires can be prevented. Take responsibility for your safety by understanding risks, respecting signs and barriers and staying within your limits. Any person who starts a fire, even accidentally, can be billed for the cost of the fire suppression. Check with your national forest or grassland for up-to-date fire restrictions and possible area closures due to wildfire or wildfire risk. Alerts will be posted on respective websites and via social media. If you are in an area where you cannot get reception, be on the alert for smoke and be ready to leave the area if necessary. Open flames like campfires and charcoal grills can easily ignite a fire in the right conditions. Respect fire restrictions which can include campfires, briquette grills, smoking, fireworks, generators and chainsaws. Plan on using a camp stove to cook your food. If you smoke, do so in an enclosed area, such as a car or on a boat. Never toss a cigarette. Ensure embers are out and then take your trash with you. Motorized vehicles with loose chains or hot undercarriages can spark a wildfire, so avoid parking or driving on dry grass. Pack safety equipment such as extra water, a fire extinguisher and shovel in your vehicle. By following a few rules and using common sense you can help protect our public lands. Tread lightly and leave no trace. Leave your site better than you found it. Remove all trash and remember to pack it in, pack it out. Personal property cannot be left unattended at national forest and grassland campgrounds for more than 24 hours or on other public lands for more than five days without written permission. There is a 14-day limit for camping on public lands. Only travel on open and signed roads and trails. National forest and grasslands provide motor vehicle use maps showing which roads are open to motor vehicle use. If a road is not on the map, then it is closed to all motor vehicle use. Motor vehicle use maps are available for free at all national forest and grassland offices and online at each area’s website. Fireworks are always illegal on national lands. IF campfires are allowed, never leave a campfire unattended and make sure an adult is present. Keep a bucket of water and a shovel nearby and make sure the fire is cold before you leave. If it’s too hot to touch, it’s too hot to leave.